Methi Matar Paneer Recipe – Peas & Cheese in Indian Spices (Glutenfree): it’s an easy Indian side recipe. Here’s an easy peasy 🙂 recipe for all my lovelies who are either fasting for the special 9days or eating no onion-garlic diet…..It’s a creamy thick gravy like consistency and the combination of methi (fenugreek) with peas that makes this dish delectable. Heat oil in a nonstick wok and add cumin seed. Add tomatoes, salt, chili powder, reduce the flame to low and cook for 3-4min covered with lid. Increase flame to medium, add fenugreek leaves, sauté and cook for another 3min. Now add paneer and sauté for 2min and reduce the flames to lowest. Add milk, water and cook till it forms thick gravy-like consistency. Sprinkle with chopped cilantro and Serve Hot. 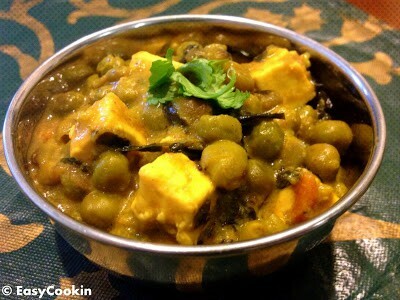 No Replies to "Methi Matar Paneer Recipe (Glutenfree)"